Whether you’re a local or just visiting for a weekend, it’s no secret that there’s plenty to do in Reno. We have world-class casinos, historical museums, and boutique shops to browse through Midtown. But casinos, interesting food, and regular festivals aside, it can seem a little daunting to find a family activity in Reno that kids will thoroughly enjoy that isn’t too boring for the adults either. We have compiled plenty of favorite activities in the area that are sure to be real crowd-pleasers, no matter what your age. Much of Reno’s best festivals, stores, restaurants are all centered around the sparkling Truckee River that runs right through the city. The Riverwalk is one of the best places to take the kids through the day. The path winds past interesting little stores, yummy restaurants of all kinds, and expansive, beautiful parks. If you catch Reno on a good weekend, you might just run into one of the many annual festivals held in the area, but even during the colder months, younger ones are sure to get some energy out while the grown-ups can get some sunshine and maybe even a good cup of joe. Miniature golf courses in Reno are some of the best in the state (especially ours…we might be a little biased, though). Not only does it give adults an edge of competition, but children of all ages love to be a part of the fun, too. Our blacklight mini golf course adds an extra edge for the entire family, and because it’s indoor, it’s awesome no matter what time of year it is. Make sure everyone wears a little white for fun glowing flair out on the course! If you’re looking to get out of the city, Lake Tahoe is only just a short drive away. Its crystal blue waters are a sight to see any time of year. Get a feel for the mountain life by checking out the shops in each little lake town, or take a good hike in one of the many trails nearby. Don’t forget to check out each trail beforehand. Many offer cool wildlife sightings and breathtaking views while still being easy enough for the youngins. 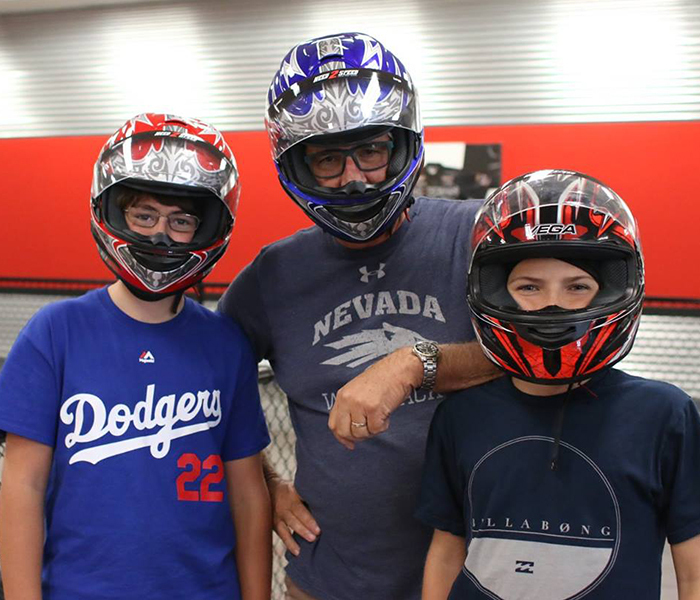 Another awesome year-round family activity in Reno is indoor kart racing! There’s nothing like the feeling of climbing into a kart, putting your hands on the wheel, and speeding around a curvy race track while fighting for first place. At Need 2 Speed, we have karts for adults that go up to 45 miles an hour, and karts for the kids that go up to 25 miles an hour so everyone can get that adrenaline and the feel for some real serious speed. Like we said, fun for the whole family in any season. Keeping the whole family happy is easy in Reno, and we love to be able to be a part of that! Not only do we offer indoor mini golf and kart racing, but our virtual reality set-up is a sight to see, too. Keep the family active and give them a weekend they won’t forget in Reno, and come visit us here at Need 2 Speed!